Just as the newly shorn golden fields on the outskirts of my village are redolent of this time of year, so in its own small way is the onion patch showing off its harvest. The red & white onions, shallots ‘Jermor’ and various garlics have all done well and are now drying on the vintage apple rack bought at a gardening fair at Farnham Maltings some years ago. It’s good to have them safely harvested and showing no signs of rot. And, delightfully, one of the little plants that Rosie Rose so kindly gave me from her marvellous huerto has put forth a flower! It was the masses of beautiful little pink agapanthus-like flowers on her plants that drew me to them, so I am delighted to have this now in my little plot. Hopefully there will be more to follow as both clumps have established nicely. Just wish I knew what they are! A visit to Wisley this afternoon brought my attention to a very similar flowering plant in the herb garden called ‘Chinese chives’ but on closer inspection the flowers were less delicate. Any ideas? 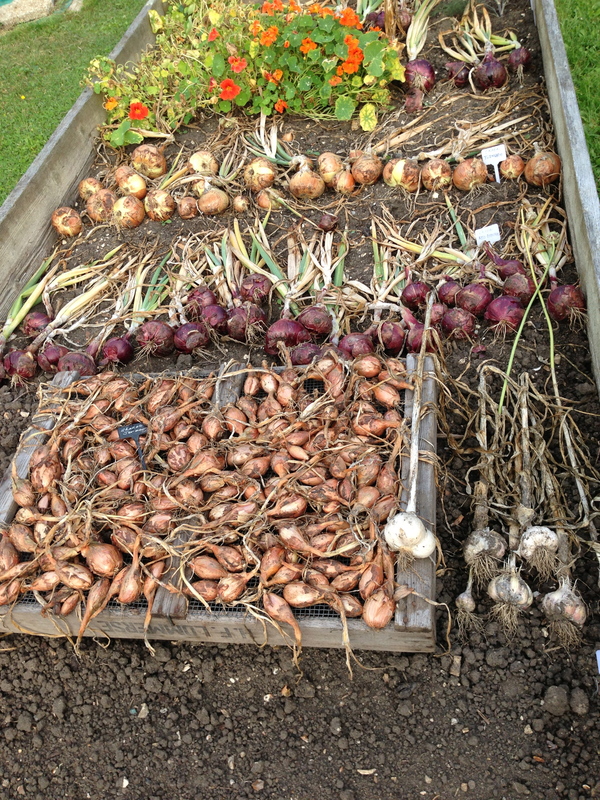 This entry was posted in Allotment, onions and tagged chinese chives, onions, shallots, vintage apple rack. Bookmark the permalink. 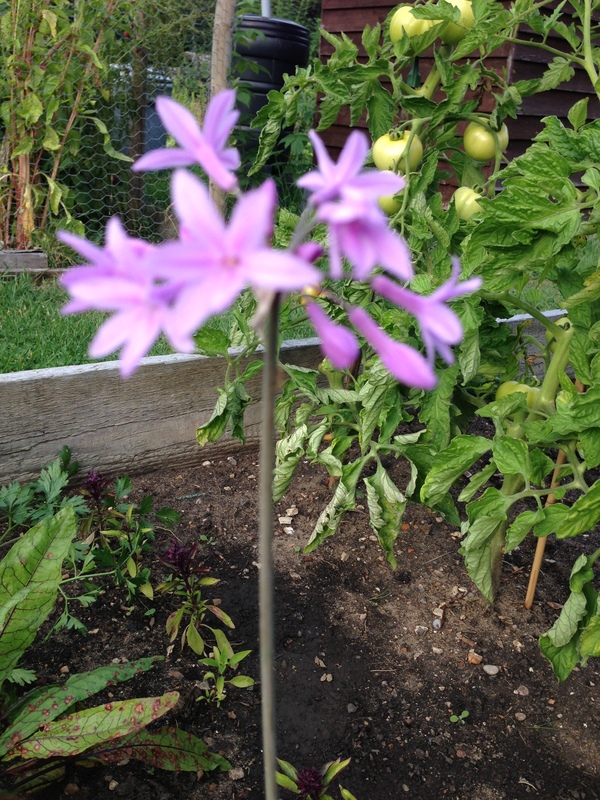 This is Tulbaghia violacea. Very pretty and flowers well so long as it gets lots of sunshine. Enjoy it. Gosh! How clever of you to know! Thank you, that’s really helpful. It’s just put out another delicately arching flower stem so hope that the weather remains warm enough for it to come into flower. It says on the RHS plant selector to protect it with a mulch over winter so I’ll certainly do that – again, thank you as I wouldn’t have realised it’s relatively tender.